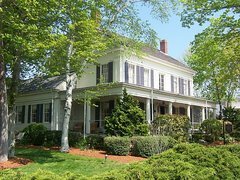 Rated among the best inns in New England, this bed and breakfast in South Yarmouth’s Bass River Village, offers rooms with private baths, Jacuzzis, phones, and cable TV amid the restored elegance of the mid-19th century. A complimentary three-course breakfast is served either in the formal dining room or interior courtyard. In the evenings, sip a glass of sherry before retiring to the elegantly-furnished rooms, some of which have working fireplaces. The inn, which is listed on National Register of Historic Places, is close to beaches and restaurants. Rates vary with season. Cancellation : When making reservations please remember that you are making a commitment to us and we are making one to you. Should you need to cancel all or part of a reservation, we must receive notice no less than fourteen (14) days prior to your scheduled arrival date. At that time your deposit will be refunded less a cancellation fee of $30. For cancellations of all or partial reservations received less than fourteen (14) days prior to your current arrival date, no refund will be issued and you will be charged for the entire reservation unless we are able to re-rent the room. Please call us as soon as possible if you must cancel your stay with us. We realize that life does happen and plans do change. We will make every effort to re-rent the room for you.